The first Global Travel destination of 2016? Eleuthera island in the Bahamas. 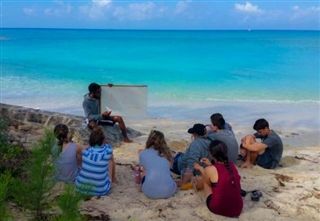 Eight students and two faculty chaperones spent their spring break exploring marine conservation, sustainability, and the region's unique cultural and environmental landscape at The Island School. Taking full advantage of a spectacular setting, the group used the outdoors as a continuation of the classroom, earning scuba diving certifications, identifying marine creatures during open water dives and discussing coral reef ecology between snorkeling sessions and cliff jumping. According to the students, The Island School and Pacific Ridge share many similarities, including a commitment to sustainability, Harkness-based learning, and intimate advisory groups. But, as demonstrated in the photo below, The Island School may have a slight edge in classroom decor.